Exephin 250 mg IV injection: Each vial contains Ceftriaxone 250 mg (as sterile Ceftriaxone Sodium for injection USP). Exephin 250 mg IM injection: Each vial contains Ceftriaxone 250 mg (as sterile Ceftriaxone Sodium for injection USP). Exephin 500 mg IV injection: Each vial contains Ceftriaxone 500 mg (as sterile Ceftriaxone Sodium for injection USP). Exephin 500 mg IM injection: Each vial contains Ceftriaxone 500 mg (as sterile Ceftriaxone Sodium for injection USP). 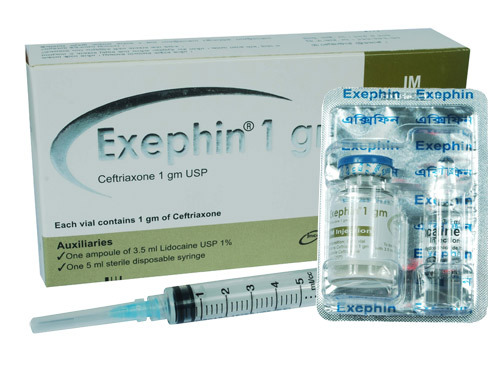 Exephin 1 g IV injection: Each vial contains Ceftriaxone 1 g (as sterile Ceftriaxone Sodium for injection USP). 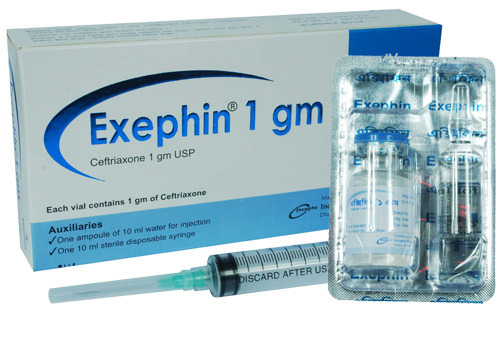 Exephin 1 g IM injection: Each vial contains Ceftriaxone 1 g (as sterile Ceftriaxone Sodium for injection USP). Exephin 2 g IV injection: Each vial contains Ceftriaxone 2 g (as sterile Ceftriaxone Sodium for injection USP). Lower Respiratory Tract Infections caused by Streptococcus pneumoniae, Staphylococcus aureus, Haemophilus influenzae, Haemophilus parainfluenzae, Klebsiella pneumoniae, E. coli, Enterobacter aerogenes, Proteus mirabilis, Serratia marcescens. Acute Bacterial Otitis Media caused by Streptococcus pneumoniae, Haemophilus influenzae (including beta-lactamase producing strains), Moraxella catarrhalis (including beta-lactamase producing strains). Skin and Skin Structure Infections caused by Staphylococcus aureus, Staphylococcus epidermidis, Streptococcus pyogenes, Viridans group streptococci, E. coli, Enterobacter cloacae, Klebsiella oxytoca, Klebsiella pneumoniae, Proteus mirabilis, Morganella morganii, Pseudomonas aeruginosa, Serratia marcescens, Acinetobacter calcoaceticus, Bacteroides fragilis, Peptostreptococcus species. Urinary Tract Infections (complicated and uncomplicated) caused by E. coli, Proteus mirabilis, Proteus vulgaris, Morganella morganii, Klebsiella pneumoniae. Uncomplicated Gonorrhea (cervical, urethral, pharyngial and rectal) caused by Neisseria gonorrhoeae, including both penicillinase- and nonpenicillinase-producing strains, and pharyngeal gonorrhea caused by nonpenicillinase-producing strains of Neisseria gonorrhoeae. Pelvic Inflammatory Disease caused by Neisseria gonorrhoeae. Bacterial Septicemia caused by Staphylococcus aureus, Streptococcus pneumoniae, E. coli, Haemophilus influenzae, Klebsiella pneumoniae. Bone and Joint Infections caused by Staphylococcus aureus, Streptococcus pneumoniae, E. coli, Proteus mirabilis, Klebsiella pneumoniae, Enterobacter species. Intra-abdominal Infections caused by E. coli, Klebsiella pneumoniae, Bacteroides fragilis, Clostridium species, Peptostreptococcus species. Meningitis caused by Haemophilus influenzae, Neisseria meningitidis, Streptococcus pneumoniae. Exephin has also been used successfully in a limited number of cases of meningitis and shunt infection caused by Staphylococcus epidermidis and E. coli. Surgical Prophylaxis: The preoperative administration of a single 1 gm dose of Exephin may reduce the incidence of postoperative infections in patients undergoing surgical procedures classified as contaminated or potentially contaminated. Generally, Exephin should be taken once or equally devided twice a day for 4-14 days. Exephin therapy should be continued for at least 2 days after the sign and symptoms of infection have disappeared. The usual duration of therapy is 4 to 14 days; in complicated infections longer therapy may be required. No dosage adjustment is required for patients with renal or hepatic impairment. Generally Ceftriaxone is well tolerated. However, few side effects including nausea, vomiting, diarrhea, dizziness and fever may occur. Pregnancy: The safety of Ceftriaxone in the treatment of infections during pregnancy has not been established. Ceftriaxone should only be used during pregnancy if the likely benefit outweighs the potential risk to the fetus and/or the mother. Lactation: Ceftriaxone is excreted in breast milk at low concentrations. Therefore, caution should be exercised when Ceftriaxone is administered to a nursing mother.